Patty Wells Mural As you’re looking at Sammy Terry look to his right and back a little bit. I’m wearing pink, Do you see me? To the left of me is Edgar Allen Poe. This is hanging in a restaurant in Madison, IN. The Second Annual Chicago Ghost Conference October 2nd and 3rd, 2009 Friday: 5pm to Midnight Saturday: 8:00am to ??? Portage Theatre, Chicago, Illinois Paranormal Speakers; Special Guests; and members of Paranormal Groups from around the country!! 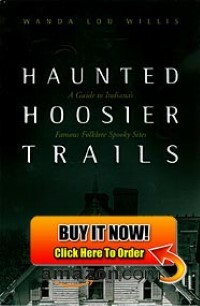 May 24, 2009: Wanda will be a guest on Cross Roads Paranormal Radio on Sunday, May 24, 2009 at 8:30pm. December 7, 2008 (Sunday); 2:00 – 3:00pm — “Holiday Stroll 2008” Hussey-Mayfield Memorial Public Library 250 N. 5th Street Zionsville, IN 46077 Wanda Lou Willis will present the folklore history of Christmas ornaments at the Hussey-Mayfield Memorial Public library in Zionsville, Indiana on December 7, 2008 from 2-3 pm. November 22, 2008 (Saturday) Holiday Party at The Mystery Company. Wanda has been invited as a special guest (beloved Indiana writer) to attend this reception-style event. Mystery Company customers will have an opportunity to see Wanda again and to purchase her signed books for gift-giving. October 25, 2008 (Saturday) Wanda will be at Waldenbooks in Greenwood, Indiana beginning at 1:00pm. 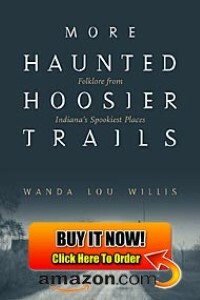 Wanda will be featured on Indianapolis radio station’s (WKLU 101.9 FM) early morning time slot, Monday – Friday, telling Hoosier haunting tales. Her first show was on Monday morning, October 27th at 8:45am. Click right HERE to view Wanda’s Guest Speaker profile on the Phenomecon 2008 website. On Tuesday evening, October 30, 2007 at 7:30pm, the WFYI (Channel 20) program Across Indiana is going to air their Halloween special from last October. Girlfriends Day Out! “Rest your weary feet from the hustle and bustle of the holiday season.” Wanda will be appearing at the Indiana History Center on Thursday, December 7, 2006 from 2:00-3:30pm, sharing the tales and history of Christmas ornaments and folklore. For more information, please click right HERE! © 2014-2019 Wanda Lou Willis - All Rights Reserved.